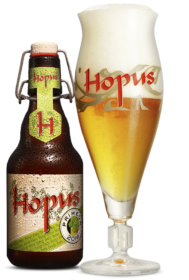 Hopus Primeur is an interesting mix between the Hopus and a 6th hop. Available only for a few months (from March 21st while supplies last), this beer is characterised by a unique taste and delicate bitterness. An additional hop was selected for the 2016 edition (A Belgian hop!). It gives the beer distinctive notes of citrus such as lemon, lime and orange, a hint of white fruit, and subtle vegetable and wooded touches. Bitterness and post-bitterness are characteristics of the classical Hopus and offer an even stronger taste. A true delight to be enjoyed young!